Anthony Christopher Kubek (born October 12, 1935) is an American former professional baseball player and television broadcaster. 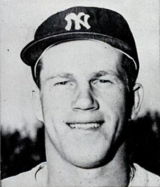 During his nine-year playing career with the New York Yankees, Kubek played in six World Series in the late 1950s and early 1960s, starting in 37 World Series games. For NBC television, he later broadcast twelve World Series between 1968 and 1982, and fourteen League Championship Series between 1969 and 1989. Kubek received the Ford C. Frick Award in 2009. A left-handed batter, Kubek signed his first professional contract with the Yankees and rose rapidly through the team's farm system. He was 21 years old when he played his first game in Major League Baseball in 1957, and—except for one year (1962) spent largely in the U.S. military—remained with the Yankees until his retirement due to a back injury at the close of the 1965 season. In his prime he formed a top double play combination with second baseman (and roommate) Bobby Richardson on an infield that also featured third baseman Clete Boyer. Kubek played 1,092 games, 882 of them at shortstop (although he also was an outfielder and utility infielder in his early career), compiling a lifetime batting average of .266 with 57 home runs. The 38 doubles he totaled in 1961 remained the Yankee club record for shortstops until 2004, and his career fielding percentage and range factor were both above league average. During his nine years with the Yankees, he played on seven American League pennant winners (1957–58, 1960–64) and three world champions (1958, 1961–1962). In a 1976 Esquire magazine article, sportswriter Harry Stein published an "All Time All-Star Argument Starter", consisting of five ethnic baseball teams. Kubek was the shortstop on Stein's Polish team. In 1982, Kubek was inducted into the National Polish-American Sports Hall of Fame. In 1986, Kubek was on hand for the only Old-Timers' Day at Yankee Stadium that he would take part in. That year, the event was a reunion of the 1961 Yankees and marked the recent passing of Roger Maris. He was signed by Yankees scout Lou Maguolo. In 1957, Kubek won the American League Rookie of the Year Award. 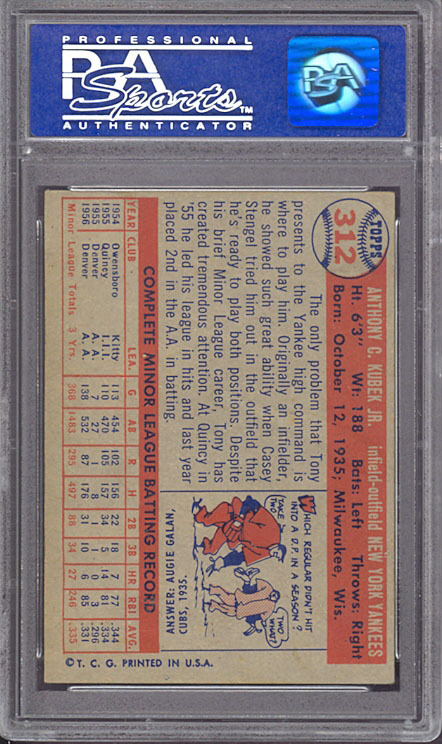 In Game 3 of the 1957 World Series, he had one of the best World Series games a rookie has ever had, going 3 for 5 with two home runs, three runs scored, and four RBI. Kubek is one of five rookies to hit two home runs in a World Series game. Another Yankee, Charlie Keller, had performed the feat in the 1939 World Series against the Cincinnati Reds and St. Louis Cardinal Willie McGee homered twice in the 1982 World Series against the Milwaukee Brewers. All three of these feats occurred in a Game 3; Kubek's and McGee's both occurred at Milwaukee County Stadium. The Atlanta Braves' Andruw Jones homered twice in Game 1 of the 1996 World Series at Yankee Stadium. Michael Conforto of the New York Mets became the fifth member of this club when he hit two in Game 4 of the 2015 World Series on October 31, 2015. In Game 7 of the 1960 World Series, Kubek was injured by a bad-hop ground ball that struck him in the throat; Kubek was badly hurt and the batter, Bill Virdon, reached first base, enabling the Pittsburgh Pirates to rally in a game they eventually won 10–9 on a ninth-inning walk-off home run by Bill Mazeroski. Kubek was sensitive about the Bill Virdon incident. When future broadcasting partner Bob Costas once referenced Virdon's smash on the air, Kubek put his hand on Costas' thigh to stop him. Just before the 1963 World Series, TV personality Phil Silvers, a Dodger fan, provided a reporter with a list of Yankee players to rattle. He included Kubek: "Show him a pebble." Upon his retirement, Kubek became a color analyst on NBC's Saturday Game of the Week telecasts, teaming with play-by-play announcer Jim Simpson on the network's backup games from 1966–68 and then joining Curt Gowdy to form the primary crew in 1969. He spent 24 years at NBC, teaming with such announcers as Simpson, Gowdy (whom Kubek later called his favorite partner), Joe Garagiola, and Bob Costas. Kubek could be considered baseball's first network baseball analyst as contrasted with a color commentator, similar to Tim McCarver and Jim Kaat later. In addition to the weekly in-season games, Kubek worked over a dozen World Series (1969–1976, 1978, 1980 and 1982) for NBC, as well as numerous American League Championship Series (1969–1975, 1977, 1979, 1981, 1983, 1985, 1987 and 1989) and All-Star Games (1969–1975, 1977, 1979 and 1981). He also worked local telecasts for the Toronto Blue Jays on The Sports Network and CTV from 1977 to 1989. The Toronto Star said that Kubek "educated a whole generation of Canadian baseball fans without being condescending or simplistic." During the winter, Kubek would go hunting, coach junior high basketball, and wait for baseball to resume. As both a local and national sportscaster, Kubek was known for his outspokenness. While calling the 1972 American League Championship Series, Kubek said that Oakland's Bert Campaneris throwing his bat at Detroit's Lerrin LaGrow (who had just knocked Campaneris down with a low, inside pitch) was justified, on the grounds that any pitch aimed squarely at a batter's legs could endanger his career. Angered by Kubek's comments, executives from Detroit's Chrysler Corporation, which sponsored NBC's telecasts, phoned then-Commissioner of Baseball Bowie Kuhn, who, in turn, called the network about the matter. On April 8, 1974, when Hank Aaron hit his record-breaking 715th career home run, Kubek, who was calling the game with Curt Gowdy and Joe Garagiola, criticized Bowie Kuhn on air for failing to be in attendance at Atlanta on that historic night. Kuhn argued that he had a prior engagement that he could not break. In the 10th inning of Game 3 of the 1975 World Series, Cincinnati's César Gerónimo reached first base. Then, Boston catcher Carlton Fisk threw Ed Armbrister's bunt into center field. Kubek, on the NBC telecast, immediately charged that Armbrister interfered (with the attempted forceout), though home plate umpire Larry Barnett did not agree. After Joe Morgan drove in the game-winning run for the Reds in a 6–5 victory, Barnett blamed Kubek and Gowdy for inciting death threats against him. Later, Kubek got 1,000 letters dubbing him a Boston stooge. In 1978, Kubek had said of New York Yankees' owner George Steinbrenner that "He's got an expensive toy. Baseball's tough enough without an owner harassing you." In a Sports Illustrated article on May 27, 1991 on the Yankees' bad season, he would go on to criticize Steinbrenner once again by saying, "George's legacy is not the World Series winners of '77 and '78 or having the best record of any team in the '80s, his legacy is these past five seasons—teams with worse and worse records culminating in last year's last-place finish." Kubek also added, "George talked a lot about tradition, but it was all phony, it was just him trying to be part of the tradition. You can't manufacture tradition in a plastic way. You have to have a certain class to go with it." The team of Kubek and Bob Costas (backing up Vin Scully and Joe Garagiola and later, Tom Seaver) proved to be a formidable pair. Costas was praised by fans for both his reverence and irreverence while Kubek was praised for his technical approach and historical perspective. One of the pair's most memorable broadcasts was the "(Ryne) Sandberg Game" (between the Chicago Cubs and St. Louis Cardinals at Chicago's Wrigley Field) on June 23, 1984. Kubek and Costas, who had worked together since 1983 (and in the process, called four American League Championship Series: 1983, 1985, 1987, and 1989), called the final edition (the 981st overall) of NBC's Game of the Week which aired on September 30, 1989. Coincidentally, that particular game featured the Toronto Blue Jays (which was as previously mentioned, a team that Kubek was long associated with as a broadcaster, from 1977 to 1989) beating the Baltimore Orioles 4–3 to clinch the AL East title at SkyDome. When the subject came up of NBC losing the rights to televising Major League Baseball for the first time since 1946, Kubek simply said, "I can't believe it!" The final broadcast for Kubek and Costas as a team was Game 5 of the 1989 American League Championship Series (October 8), also at SkyDome, where the Oakland Athletics won to advance to the World Series. When NBC lost its baseball TV rights to CBS after the 1989 season, Kubek left the national scene, joining the Yankees' local cable-TV announcing team (which earned Kubek US$525,000 a year). I hate what the game's become—the greed, the nastiness. You can be married to baseball, give your heart to it, but when it starts taking over your soul, it's time to say 'whoa'. Kubek added, "I want to go home and spend more time with my family. They deserve it more than anyone. I don't need that ego stuff. I feel sorry for those who do." Kubek's resignation coincided with the bitter strike that wound up cancelling the World Series in 1994. In a 2008 New York Times article, Kubek claimed not to have seen a major league game since his retirement from broadcasting. Kubek lives in Appleton, Wisconsin and is a supporter of the Fox Valley Lutheran High School and its baseball team. On December 22, 2008, Tony Kubek was named the recipient of the 2009 Ford C. Frick Award, an honor bestowed on broadcasters by the Baseball Hall of Fame. Kubek was selected for the honor by a committee of 15 prior Frick Award winners and five broadcast historians and columnists. He became the first Frick Award winner whose broadcast career was solely in television, and the first to have called games for a Canadian team, the Toronto Blue Jays, from 1977-89. Kubek is a committed Democrat. In 1976, he declined to go to South Carolina to campaign for former teammate Bobby Richardson, a Republican, who ended up losing a close race for the U.S. House of Representatives to incumbent Democrat Kenneth Holland by a 51% to 48% margin. ^ "Lou Maguolo". Baseball-Reference.com. Retrieved June 17, 2015. ^ a b Harold Friend. "How Did Tony Kubek Break His Neck?". Bleacher Report. Retrieved December 25, 2016. ^ Smith, Curt (1992). Voices of the Game. New York: Fireside. p. 433. ISBN 0-671-73848-8. ^ Richard Sandomir (September 20, 1994). "TV SPORTS; Kubek Goes Home, With the Last Word". The New York Times. ^ Nelson, John (April 20, 1995). "Baseball's Back on TV, But Will Fans Tune In or Turn Off?". Associated Press. Retrieved December 25, 2016. ^ Harvey Araton (July 22, 2008). "Kubek's New Life". The New York Times. ^ Proeber, Sarah. "News & Media". Wels.net. Retrieved December 25, 2016. ^ a b "Kubek Named 2009 Ford C. Frick Winner" (Press release). National Baseball Hall of Fame and Museum. December 9, 2008. Retrieved December 9, 2008. ^ "Record set for online fan votes; winner to be announced Dec. 9" (Press release). National Baseball Hall of Fame and Museum. October 6, 2008. Retrieved November 10, 2008. ^ Halberstam, David (1995). October 1964. Random House Digital, Inc. pp. 366–67. ISBN 0-449-98367-6. "Kubek no longer defined by baseball"